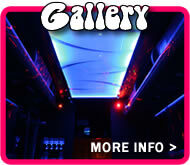 Party Bus Hire Manchester, Bury, Bolton And Lancashire. 20 Seater Boogie Bus Limousine For School Proms, Hen Nights, Birthdays And Parties. 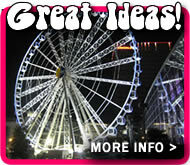 Party Bus Hire Manchester, Bolton, Bury And Lancashire - Join Us For A Celebration! The Boogie Bus is the ultimate way to travel for any kind of special occasion. Perfect for school proms, stag dos, hen nights, birthdays and even airport transfers, our luxury limousine style minicoach is funky, fun and very colourful! Our minicoach is fitted to the best standards in the industry and you will enjoy a real 'nightclub on wheels' experience when you step aboard! Top of the range 12,000 watt sound system; amazing sound quality and base - the best in town!!! Seating for upto 20 passengers - one of the largest available in the north west! This exclusive Manchester Party Bus is fully licensed, compliant with VOSA regulations regarding passenger-carrying vehicles and insured for upto 20 passengers per journey. Delivering excellent value for money whatever the nature of your booking, we also serve customers in Stockport, Bury, Chorley, Burnley, Bolton, Rochdale, Wigan and Blackpool. If you're planning a party or big night out make sure you contact us today for prices and availability! See The Boogie Bus YouTube Video Here! For bookings and enquiries please call us on 0800 083 1782 (or call our local number 01204 522 422). Alternatively, to send a message online, use our 'get a quote' page to notify us of your travel plans. We check for new enquiries during office hours and reply to all requests on the day of receipt. 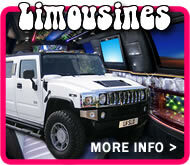 The Best Value Party Bus Manchester Has To Offer! Remember, we are not a limousine broker so the images you see on this website are genuine images of our vehicles - what you see is what you get for your booking! As we deal with our customers directly (instead of using a broker or agent) we are able to provide the best rates and packages available. We are flexible to our customer's requirements and our bookings can be tailor-made to suit your individual occasion and travel plans! Looking for great venues to travel to when you travel with us? Check our Manchester party bus guide to nights out for ideas on the best bars, clubs and districts to visit when you hit the town with us! Get your groove on and spice up your party plans with us! THE LIST OF FEATURES AND SPECIFICATIONS VARY BETWEEN EACH OF OUR BUSES. IF YOU HAVE SPECIFIC REQUIREMENTS FOR YOUR BOOKING PLEASE CONTACT US DIRECTLY. © 2015 - present Speedway Designs Ltd. Postal address: The Boogie Bus, Halfway Service Station, Bolton Road, Radcliffe, Manchester, M26 4FP.